Ceramic Egg with a delicate Asian theme. Golden accents make this a true display piece. Ceramic vase with a delicate Asian theme. Golden accents make this a true display piece. Ceramic plate with a delicate Asian theme. Golden accents make this a true display piece. Handcarved Cork sculpture in a gloss wood and glass frame. Shapes may vary slightly from that shown. 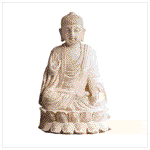 A classic Buddha strikes a pose of tranquility, clad in flowing temple robes. Beautiful faux-stone finish looks like hand-carved marble. A touch of grace for any tabletop! 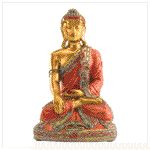 Captured in a classic position of meditation, a traditional Buddha figurine is resplendent in gleaming gold finish and rich burgundy robes trimmed with sparkling gems. The very image of wisdom and serenity! Polyresin. 5 7/8" x 5 3/8" x 9 1/4" high.